The all-time classic high performance freeride kite, the benchmark in big air superiority and stunning hangtime, designed by kite designer legend Ken Winner. The Rebel is the all-time classic freeride kite, legendary performance, big air superiority and a stunning hang time. Last year the Rebel had a significant overhaul that saw the design built around a 4 line set up. The kite was a huge success and this year Ken Winner has been working hard to make the best even better! Updates on the 2019 model include a smaller, reduced diameter leading edge and a flatter centre shape profile. The goal was to improve the handling and boosting capabilities of the kite. The thinner leading edge makes the new Rebel more efficient, but also allows it to twist, increasing the turning speed and making the handling very dynamic. The new flatter profile in the centre of the kite adds power and improves the flying characteristics. More importantly, the kite now jumps higher and floats for longer; massive airs are even easier on the new Rebel! The kite can be flown in the standard 4 line set up, or if you wish, there is a 5th line upgrade available too. The Rebel works perfectly with the Click Bar in either 4 or 5 line configuration. As ever the wind range is huge, there is plenty of low-end power, and the high-end is incredible with the 5-strut design keeping the canopy stable even in gusty conditions. Sheet and go handling makes the Rebel incredibly easy to fly, it’s suitable for riders just starting out on their kitesurfing journey as well as pro’s who want to boost to the moon and everyone in between. 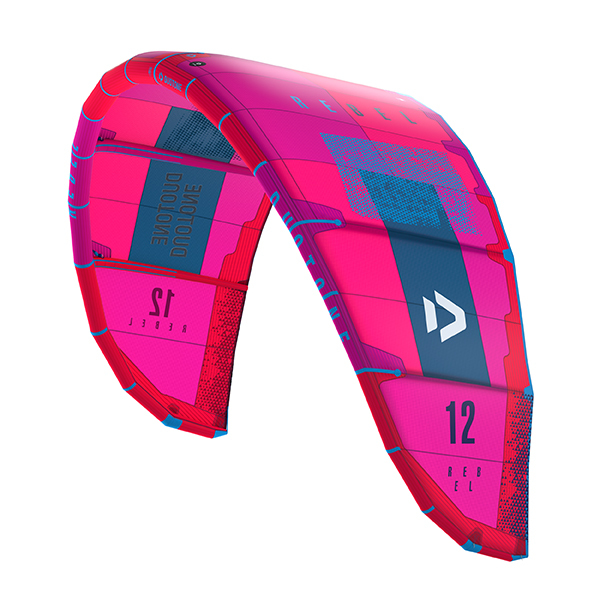 This iconic kite has long been the freeride standard all other kites try to emulate, now the bar is set even higher, the new 2019 Rebel will blow you away.